Vehicles fueled by propane autogas are ideal for businesses that demand consistent performance day in and day out, like those in the parking industry. And, alternative-fueled options, like ROUSH CleanTech’s line-up of propane-powered Ford commercial vehicles, can help parking management companies reduce their fleet’s bottom line. There are more than 27 million on-road vehicles fueled by propane autogas around the world. Propane is the leading alternative fuel in the United States and the third most commonly used vehicle fuel, following gasoline and diesel. In the U.S., there are about 19,000 propane-fueled vehicles equipped with ROUSH CleanTech technology on the road. Companies don’t need to have a large fleet to reap the benefits — current propane fuel system technology enables you to order the number of vehicles needed, whether that’s one or a dozen or 100. This is especially attractive to parking companies that want to adopt new fuel technology as current aging vehicles need replacement. The fuel that powers these vehicles, propane autogas, costs less per gallon than conventional fuels. On average, propane is about 40 percent less than gasoline and 50 percent less than diesel. In addition to fuel cost savings, parking companies have experienced lower costs for oil changes and routine maintenance due to the fuel’s clean-burning properties. 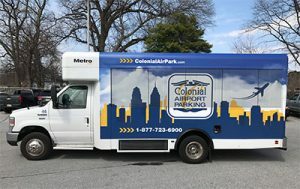 “Our mechanic is astonished at how clean the oil is when our propane vehicles are due for service, and our drivers say that the propane vehicles function better than our gasoline vehicles, especially during cold winter months,” said John Groden, operations manager for Colonial Airport Parking. Some transportation contractors have experienced 50 percent savings in maintenance. Compared with diesel, engines powered by propane autogas require less oil per oil change (7 quarts vs. 17 – 30 quarts), and no additional diesel emissions fluids or hardware. Propane vehicles eliminate the need for particulate trap systems, EGR systems, and turbochargers and intercoolers. Filter packages cost about 60 percent less on propane vehicles. With modern propane autogas systems, the propane remains in a liquid state until it gets to the cylinder. This has alleviated cold start issues associated with vapor technology propane systems of the past. A propane fuel system provides unaided cold weather starts to -40 degrees Fahrenheit — reducing time and labor costs on those frigid days. Comparing total cost of ownership between various vehicles also helps fleet managers make a more informed decision. The higher the annual miles driven and the lower the vehicle’s fuel efficiency, the more likely propane autogas will provide a quick return on investment. How much could a parking operator’s fleet save with propane? This savings calculator from the Propane Education & Research Council helps measure lifetime operating and ownership costs. There are several funding opportunities available to help pay for these alternative fuel vehicles, too. The U.S. Energy Department’s Alternative Fuels Data Center lists state and federal funding opportunities, and propane autogas vehicles could be eligible for funding from the Volkswagen settlement’s Environmental Mitigation Trust. 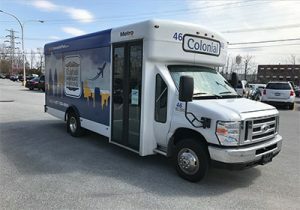 Depending on your state’s EMT plan to reduce nitrogen oxides (NOx) emissions in accordance with this settlement, funding for Class 4-8 shuttle buses could be included.